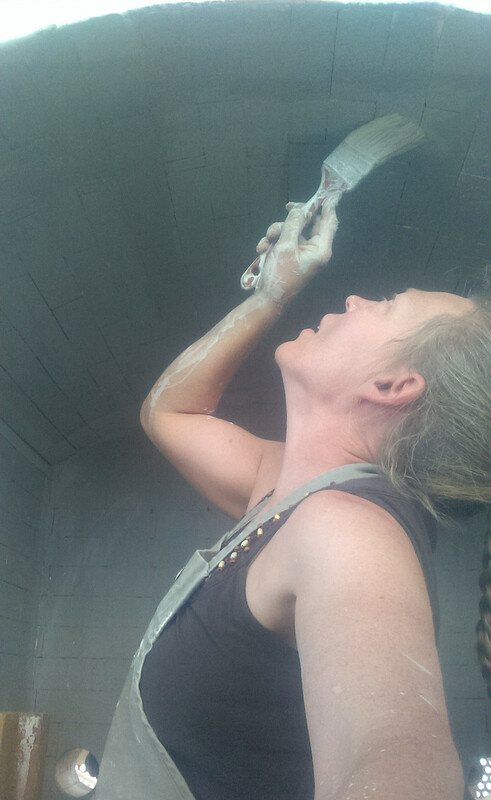 I fire in electric, gas and wood kilns, as well as in an outdoor pit. Electric kilns aren't very exciting to photograph but here are the others. These are all fun to fire; I think firing this little wood kiln is the greatest fun in the world. We fire it to cone 8 in three hours or so. Then again, a neurosurgeon thinks poking around in people's brains is the greatest fun in the world. Everybody has their own idea of fun! The pit burning before it is covered. Very small wood kiln at cone 7 after three hours of firing. Applying kiln wash to Kiln Bill. Loading Kiln Bill, the 30 year-old Marathon kiln at the Washington Heights Art Center. Kiln Bill is useful for roasting marshmallows.